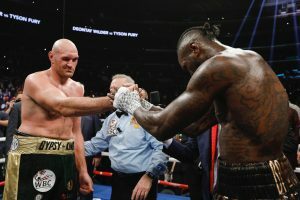 The boxing world was expecting the rematch between Deontay Wilder and Tyson Fury to be sealed this week. Negotiations have taken a twist it would seem after the announcement that Tyson Fury has signed a co promotion deal with Top Rank. The general feeling is that negotiations will prove difficult with Top Rank aligned to ESPN and Wilder being represented by Al Haymon who runs PBC. With the last fight being shown on Showtime, there was an expectation that the rematch would be shown on Showtime too. However, that may not be the case as Wilder told ThaBoxingVoice: “If anything, it makes the fight better, it don’t hurt the fight. “If anything it hurts the other competition with Joshua, that Fury’s signing with ESPN. He [Joshua] is with DAZN, it don’t really affect me. “At the end of the day, if he wants to fight, then he’s gonna fight. If not, then we’ll move onto the next one. We have enough guys in the stable that we can fight for the next two years. Despite being represented by Al Haymon, Wilder claims he doesn’t have any deals specifically with PBC, Showtime or FOX. When asked if he would fight on ESPN, Wilder replied, “Of course, it’s always where the money is, is gonna be right. “I’m a free agent, I can fight anyone, I don’t necessarily have to fight on the networks that I’m on, I can fight anywhere. In the event the rematch doesn’t take place on the rumored date of May 18th, Wilder is still aiming to fight on that date. Wilder stated: “We’re doing our own thing, we’re still gonna have that date. Who knows who it’s gonna be? Top Rank supremo Bob Arum believes Fury now has a better negotiation stance than he did last week. The WBC ordered a 60-40 split in favor of their champ Deontay Wilder and even if Top Rank win the purse bid, Wilder will earn more. Arum also distanced himself from the rumored May 18th date at the Barclays Centre in Brooklyn which seemed set to be announced only days ago.